Monitoring the world’s forests requires looking at things both large and small. With forests covering a vast 30 percent of the Earth’s land surface, large-scale public satellite programs help scan forests rapidly at medium and coarse resolutions. But to really understand how a forest is changing, or identify the drivers of deforestation, you need ultra-high-resolution satellite images that show the finer details. Forest managers have traditionally lacked the latter — less than a decade ago, even a moderate-resolution image could have cost thousands of dollars, rendering this powerful resource too expensive for conservation efforts. That all changed when NASA and USGS released their Landsat archives for free, and the game may be about to change again. Companies are now pioneering ways to also bring high-resolution images to scientists and the public at little or no cost to analyze them for critical information about forests around the world. UrtheCast is the latest company to lend its immense Earth Observation capacity to the cause, in partnership with Global Forest Watch (GFW) — a dynamic online platform that allows anyone, anywhere with an internet connection to monitor the loss of trees around the world. Soon, Global Forest Watch will roll out a feature that allows users free access to UrtheCast images, ranging in resolution from 20m to as high as 70cm in resolution, all sortable by filter, maximum cloud cover percentage, and date range. 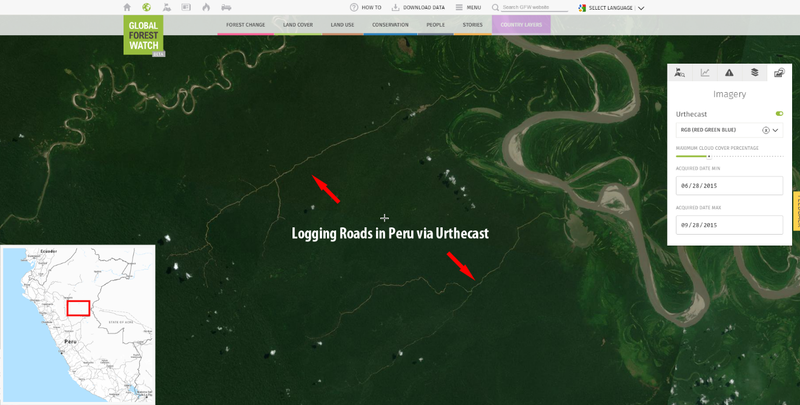 A sneak peek at UrtheCast’s high-resolution imagery mosaic on Global Forest Watch. Sign up for the GFW newsletter to be notified when it goes live. GFW users will also be able to subscribe to email updates and can be notified as new images for their areas of interest are acquired. Care about fires in Indonesia or the spread of illegal logging in Peru? You’ll be able to track these changes not only using GFW’s data sets and alert systems, but see them with your own eyes. Today, many forest stakeholders rely on remote sensing technologies powered by satellite imagery to make better informed decisions around forest management and conservation. Thanks to companies like UrtheCast, access to high-quality images continues to increase, as does our ability to monitor global forest change and put information into the hands of more stakeholders around the world. Perspectives from UrtheCast on Vimeo. Sign up for the Global Forest Watch newsletter for more updates.